Patience is the mother of all virtues... Five years. Five long years. Five very long years. Whereas some bands release an album every 12 or 18 months, Falkenbach's mastermind Vratyas Vakyas took his time to deliver this new masterpiece Ok Nefna Tysvar Ty. 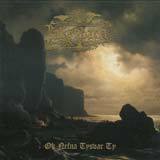 Of course it was worth the wait, because this album is a true jewel of sword handling and wind blowing viking metal. For those of you who don't know anything about Falkenbach, then I would say they are the best viking metal band ever. Their sophomore album Magni Blandinn Ok Megintiri was already at the time of its release, a pure jewel of viking metal, but their third album is a notch up. Throughout seven songs Falkenbach brings you on a journey through time during the ages when northern people were sailing across Europe with their drakkars, robbing the lands of unholy christian believers. Close you eyes and hear the epic and heroic hymns-like compositions of Falkenbach as you feel the wind through your hair and the cold breeze on your skin as you sail in the forgotten lores of the Northern Sea in a cold winter day. Close your eyes again as your listen to those amazing folksish sounding viking melodies and feel the blood on your skin, the sword in your hand, after you've been injured on the battlefields, feel the northern breeze as you slowly fade away and Odin grants you to Valhalla. No words could ever describe the world of Falkenbach. But everyone can close his eyes and imagine he is sailing the Northern Sea as he listens to the magical musical journey of a band that proves metal is more than just noise or whatever.